Hydrogen peroxide and peracetic acid are versatile oxidizing agents that combine powerful oxidation with exceptional environmental compatibility. Their bona fide green chemistry credentials should help every modern chemist appreciate their potential applications. 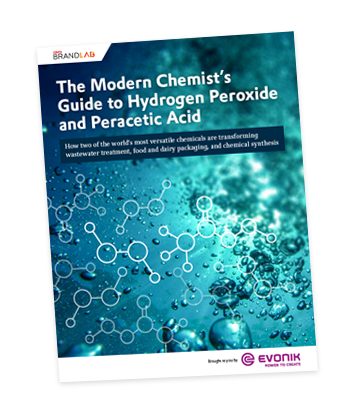 This comprehensive ebook delves into the myriad applications for hydrogen peroxide and peracetic acid, with chapters highlighting their role in chemical synthesis, aseptic packaging, and environmental applications such as wastewater treatment. This ebook can be downloaded in its entirety or as individual chapters. The chapters cover the roles of hydrogen peroxide and peracetic acid in chemical synthesis, aseptic packaging and wastewater treatment. Please choose if you would like to download the entire ebook or one of the chapters.